Kerchiefs are very versatile. They can be worn as an accessory, for the head or for the neck. They keep your hair away from your face and protect your tresses like a hat. And best of all, they look great on everyone! This quick kerchief is made in one piece with just 17 rows of a modified mesh pattern. It’s easy to adjust the size, simply crochet less or more rows to decrease or increase the size. When you’re done, embellish it with your favorite flowers or bows or whatever you like. Or, keep it as it is! Enjoy! Need help understanding the abbreviations and symbols?Check out the crochet abbreviation chart! Ch 54, (dc, hdc, sl st, hdc, dc, ch 3, sl st) into back ridge of 4th chain from hook, sl st into back ridge of all ch. (2 sc, picot) around the post of each dc, picot in center point of kerchief, (2 sc, picot) around the post of each dc, except for last, 2 sc in last dc. Sc in next 2 dc, 2 sc in next ch-3 space, (3 dc in next sc, sc in next ch-3 space) 15 times, sc in same ch-3 space, sc in next 2 dc, sl st to beginning of strap 1. Finish off and weave in ends. I hope you like it! If you have any questions, just leave a comment below. This entry was posted on Thursday, May 12th, 2011 at 12:10 PM by Claire Ortega-Reyes	and is filed under Free Crochet Patterns. You can follow any responses to this entry through the RSS 2.0 feed. You can leave a response, or trackback from your own site. What a sweet project! This is so cute!! This is sooooooo pretty! I must must must make one!!! Hi Wanda, all the pages on Crochet Spot are coded to be printer friendly. So when you use the print function in your internet browser it will only print the pattern and not all the other stuff that’s on the screen. i’m getting to where i have a strong preference for patterns with diagrams!! i’ve also noticed that many other crocheters must have the same fondness for schematics, because patterns with diagrams seem to get better reviews and higher ratings on several of the big online sites. this pattern is so cute, and very simple, yet all of those words imply that it is more complicated than it truly is. an accompanying diagram would provides a quick look-see to confirm the written instructions and probably result in less ripping out and fewer mistakes. i will draw a diagram for myself before starting. i’d love to see more patterns with accompanying diagrams! Love the kerchief pattern. Thank you for giving it to us. Also, thank you for answering Wanda as to the printing. I have highlighting and copy and printing selection. Now I can do it the easy way.Thanks again. Hi Rachel, This is so cute. Can’t wait to try making one. Thanks for the pattern! Could a bunch be made in different colors (without the straps) and sew them together to make a throw or a blanket? You can try doing that (I would love to see how it turns out! ), but if you want to maintain that triangle shape, you can just continue working the pattern, increasing the number of stitches accordingly. Good luck with your project! I´m desperate… I´m sitting here with this nearly finished kerchief but when I get to this point, the side edging, I don´t understand one thing. Can you please please help me sort things out? Hello Åsa, At this point, we’re working on the sides of the kerchief, making 2 sc and a picot on the side of each dc we had made previously, until we get to the point, and do the same one the other side. A picot is made by making ch 3, sl st on top of last sc made. For more information on picots, please read http://www.crochetspot.com/how-to-crochet-picot-stitches/. Thank you so much! 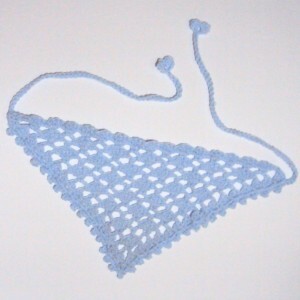 I´ve just finished it:-) What an adorable kerchief!!! Hello, what do you mean by 3 spaces? Hi Delia, a “ch-3 space” is a space that is created by chaining 3 on the previous row. Here’s more info about chain spaces if you need it: What is a Chain Space (ch-sp)? this is a lovely pattern, i loved it so much; found it today and already working on it. Im gonna keep crocheting more rounds to make it into a shawl and maybe add some fringes to it. Thank you so much. ***3 dc in next sc…??? Is it 3 DC in each sc? Or 3 DC in the first sc only and skipping the next 2 sc? There is only 1 sc on row 3. So you are going to make 3 dc into that 1 sc. If you made 3 sc on row 3, then you may have accidentally read the pattern incorrectly. Let me know if you need more help with it and I can help you further. Hi! I love this kerchief but I’m having a little trouble. I got to row six, after the beginning double crochets and chain where it says to repeat the group of sc 3dc sc twice and then three double crochet at the last dc. Twelve dc in all. But I have three sc in that row. Do I have to skip the last sc? That doesn’t look right. I’ve cHelen my other rows and everything seems to be fine. What am I doing wrong? Hi Heather! You should have 12 dc and 4 sc on row 6 when you are done. When you work the repeat a second time, you are start with the repeat with “ch 3, sc in next ch-3 space” so you are skipping the single crochet that is between the 2 chain spaces. Hello! I’ve just finished the kerchief, it is very nice. Thank you so much for sharing the pattern which is easy to follow; everything was clear for me without any problem. Just finished the kerchief! Thank you for sharing!!! I just love it!!!! Thx for sharing! I had just made one! Very nice! Great to see your post! Just wondering if anyone has any ideas why my kerchief isn’t gaining height as easily as width. The pattern is being followed exactly, it looks adorable, but I am now to the point where it is wide enough to stop and do the border yet it doesn’t cover the top of my head 🙂 Any ideas? Great pattern – I would like to adapt it to make a modesty bib by using finer thread I hope it works – thank you.